My platelets were exactly the same today as they were last week so that means no chemo for this week. On the plus side my neutrophils are up a bit at 1.4 so I have a bit more of an immune system. They are still beneath a normal person’s results but that’s expected at this point with the drugs I’ve been on and I’ll take what I can get! My hb is 105, it’s hovering round 100 which is a good level for me. 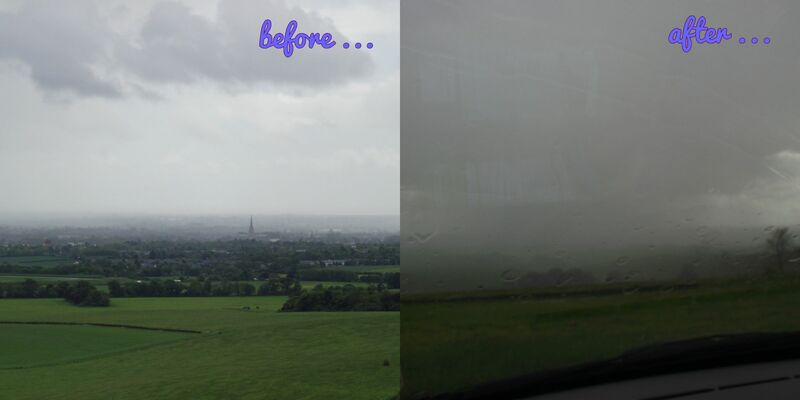 On Monday my aunty and I drove up to the trundle hill for a picnic because there is a lovely viewpoint up there, but within minutes of arriving the rain came and the whole of West Sussex was engulfed in cloud… which kind of ruined the view a bit, as you can see! Life is getting pretty dull sitting around waiting for the chemo, the only exciting thing I did today was catch up with a friend. After that I didn’t really feel like doing any of the tasks I’d set myself so I watched Breaking Bad and read a book all afternoon. In the beginning it took us quite a while to get used to the fact that you can have down days where you either feel rubbish or are just lazy, in fact you need to! When I came off the first course of steroids (on which I was buzzing and doing lots) I crashed and after reading MacMillan booklets such as “How are you feeling? : The emotional effects of cancer” (honestly not something I thought I’d ever need!) I embraced the rest days as they are good for my body while its cells are killed! The next step is bloods again on Thursday and who knows what those results will be!